"KKR" redirects here. For the cricket team, see Kolkata Knight Riders. For other uses, see KKR (disambiguation). KKR & Co. Inc. (formerly known as Kohlberg Kravis Roberts & Co. and KKR & Co. L.P.) is a global investment firm that manages multiple alternative asset classes, including private equity, energy, infrastructure, real estate, credit, and, through its strategic partners, hedge funds. The firm has completed more than 280 private equity investments in portfolio companies with approximately $545 billion of total enterprise value as of June 30, 2017. As of September 30, 2017, Assets Under Management (“AUM”) and Fee Paying Assets Under Management (“FPAUM”) were $153 billion and $114 billion, respectively. The firm was founded in 1976 by Jerome Kohlberg, Jr., and cousins Henry Kravis and George R. Roberts, all of whom had previously worked together at Bear Stearns, where they completed some of the earliest leveraged buyout transactions. Since its founding, KKR has completed a number of transactions including the 1989 leveraged buyout of RJR Nabisco, which was the largest buyout in history to that point, as well as the 2007 buyout of TXU, which is currently the largest buyout completed to date. KKR has offices in 21 cities in 16 countries across 5 continents. The firm is currently headquartered in the Solow Building (9 W. 57th Street, New York, NY), but in October 2015, the firm announced its intentions to occupy a newly constructed 30 Hudson Yards. In October 2009, KKR listed shares in the company through KKR & Co., an affiliate that holds 30% of the firm's ownership equity, with the remainder held by the firm's partners. In March 2010, KKR filed to list its shares on the New York Stock Exchange (NYSE), with trading commencing four months later, on July 15, 2010. KKR is led by its executive leadership team, Henry Kravis, George R. Roberts, Joe Bae, and Scott Nuttall. The firm employs approximately 375 investment professionals and 1,250 total employees as of December 31, 2017. KKR is headquartered in the Solow Building at 9 West 57th Street, Manhattan, New York, with offices in Menlo Park, San Francisco, Houston, London, Dublin, Paris, Madrid, Luxembourg, Hong Kong, Tokyo, Beijing, Shanghai, Mumbai, Dubai, Riyadh, Seoul, São Paulo, Singapore, and Sydney. KKR's business operates in four segments: private markets, public markets, capital markets, and principal activities. Through its private markets segment, the firm manages and sponsors a group of private equity funds that invest capital for long-term appreciation, either through controlling ownership of a company or strategic minority positions. In addition to traditional private equity funds, KKR sponsors investment funds that invest in growth equity and core equity. The firm also manages and sponsors investment funds that invest capital in real assets, such as infrastructure, energy and real estate. KKR has raised 23 private and growth equity funds with approximately $102.9 billion of capital commitments through December 31, 2017. Its private equity investment strategy typically seeks to engage primarily in management buyouts, build-ups, or other investments with a view to acquire a controlling or significant influence. The firm has sourced several smaller growth equity investments and expanded the business by launching dedicated growth equity funds. KKR's first dedicated growth equity fund, launched in 2016, invests in the technology, media and telecommunications sector, primarily in the United States, Canada, Europe and Israel. In 2016, KKR also launched its second dedicated growth equity fund to pursue investments in the health care sector, also primarily in the United States. As of December 31, 2017, they have received $2.0 billion of capital commitments to these strategies. In 2017, they further expanded on their private equity business by making their first core equity investment, targeting investments that have a longer holding period and a lower risk profile. KKR's energy business aims to deliver current returns to fund investors through distributions generated by producing and selling oil and natural gas reserves and capital appreciation, and targets real asset investments across the upstream and midstream segments of the oil and gas industry. KKR invests in these energy strategies primarily through the KKR Energy Income and Growth Fund. As of December 31, 2017, they have received $2.9 billion of capital commitments to their energy funds and $1.0 billion of capital commitments to this strategy through separately managed accounts. KKR's infrastructure platform seeks to achieve returns including current income through the acquisition and operational improvement of assets important to the functioning of the economy. The platform has made investments in parking, alternative energy, district heating and contracted electricity generation, water and wastewater, locomotive transportation, midstream and telecommunications infrastructure. As of December 31, 2017, KKR had received $4.1 billion of capital commitments to its infrastructure funds and $1.1 billion of capital commitments to this strategy through separately managed accounts and co-investment vehicles. KKR's real estate platform targets real estate equity primarily in the United States and Western Europe. The firm's equity investments include direct investments in real property, debt, special situations transactions and businesses with significant real estate holdings. As of December 31, 2017, KKR has received $3.9 billion of capital commitments through its real estate equity investment funds. KKR's real estate credit platform provides capital solutions for complex real estate transactions with a focus on commercial mortgage-backed securities, whole loans and subordinated debt. As of December 31, 2017, KKR managed approximately $2.2 billion of assets in its real estate credit strategy, which include KKR Real Estate Finance Trust Inc. ("KREF"), a NYSE-listed real estate investment trust ("REIT"), and $1.1 billion of capital commitments through a real estate credit fund. KKR's credit business invests capital in leveraged credit strategies, including leveraged loans, high-yield bonds, opportunistic credit and revolving credit strategies, and alternative credit strategies, including special situations and private credit strategies such as direct lending and private opportunistic credit (or mezzanine) investment strategies. KKR's hedge fund business consists of strategic manager partnerships with third-party hedge fund managers in which KKR owns a minority stake. As of December 31, 2017, the strategic manager partnerships with third-party hedge fund managers accounted for $26.2 billion of AUM. In December 2017, FS Investments and KKR announced they are pooling together more than $18 billion in private capital to invest in mid-sized businesses, in a push to do bigger deals which are out of reach for other alternative lenders. KKR's capital markets business mainly arranges debt and equity transactions for the firm, its portfolio companies, and third parties. KKR's capital markets group raised $815 million of debt needed to close the purchase of Mills Fleet Farm in 2016. The Principal Activities segment uses KKR's balance sheet assets to support its investment management and capital markets businesses. KKR uses this capital for general partner commitments and to establish a track record for fundraising purposes in new strategies, such as the approximately $1 billion invested in KKR's real estate business as of 2017. While running the corporate finance department for Bear Stearns in the 1960s and 1970s, Jerome Kohlberg, and later Henry Kravis and George Roberts, completed a series of what they described as "bootstrap" investments beginning in 1964–65. They targeted family-owned businesses, many of which had been founded in the years following World War II which by the 1960s and 1970s were facing succession issues. Many of these companies lacked a viable or attractive exit for their founders as they were too small to be taken public and the founders were reluctant to sell out to competitors and so a sale to a financial buyer could prove attractive. Their acquisition of Orkin Exterminating Company in 1964 is among the first significant leveraged buyout transactions. In the following years the three Bear Stearns bankers would complete a series of buyouts including Stern Metals (1965), Incom (a division of Rockwood International, 1971), Cobblers Industries (1971), and Boren Clay (1973), as well as Thompson Wire, Eagle Motors and Barrows through their investment in Stern Metals. Despite a number of highly successful investments, the $27 million investment in Cobblers ended in bankruptcy. By 1976, tensions had built up between Bear Stearns and Kohlberg, Kravis and Roberts, which led to the formation of Kohlberg Kravis Roberts & Co. in that year. Most notably, Bear Stearns executive Cy Lewis had rejected repeated proposals to form a dedicated investment fund within Bear Stearns and Lewis took exception to the amount of time spent on outside activities. The new KKR completed its first buyout, that of manufacturer A.J. Industries, in 1977. KKR raised capital from a small group of investors including the Hillman Company and First Chicago Bank. By 1978, with the revision of the ERISA regulations, the nascent KKR was successful in raising its first institutional fund with over $30 million of investor commitments. In 1981, KKR expanded its investor base when the Oregon State Treasury's public pension fund invested in KKR's acquisition of retailer Fred Meyer, Inc. Oregon State remains an active investor in KKR funds. 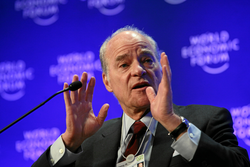 After the 1987 resignation of Jerome Kohlberg at age 61 (he later founded his own private equity firm, Kohlberg & Co.), Henry Kravis succeeded him as senior partner. Under Kravis and Roberts, the firm was responsible for the 1988 leveraged buyout of RJR Nabisco. RJR Nabisco was the largest buyout in history at that time, at $25 billion ($31.1 billion, including assumed debt), and remained the largest buyout for the next 17 years. The deal was chronicled in Barbarians at the Gate: The Fall of RJR Nabisco, and later made into a television movie starring James Garner. In 1988, F. Ross Johnson was the president and CEO of RJR Nabisco, formed in 1985 by the merger of Nabisco Brands and R.J. Reynolds Tobacco Company, a leading producer of food products (Shredded Wheat, Oreo cookies, Ritz crackers, Planters peanuts, Life Savers, Del Monte Fruit and Vegetables, and Snickers Chocolate) as well as Winston, Camel and Salem cigarettes. In October 1988, Johnson proposed a $17 billion ($75 per share) management buyout of the company with the financial backing of investment bank Shearson Lehman Hutton and its parent company, American Express. Several days later, Kravis, who had originally suggested the idea of the buyout to Johnson, presented a new bid for $20.3 billion ($90 per share) financed with an aggressive debt package. KKR had the support of equity co-investments from pension funds and other institutional investors. Investors included Coca-Cola, Georgia-Pacific and United Technologies corporate pension funds, as well as endowments from MIT, Harvard and the New York State Common Retirement Fund However, KKR faced criticism from existing investors over the firm's use of hostile tactics in the buyout of RJR. KKR proposed to provide a joint offer with Johnson and Shearson Lehman but was rebuffed and Johnson attempted to stonewall KKR's access to financial information from RJR. Rival private equity firm Forstmann Little & Co. was invited into the process by Shearson Lehman but attempted to provide a bid for RJR with a consortium of Goldman Sachs Capital Partners, Procter & Gamble, Ralston Purina and Castle & Cooke. Ultimately the Forstmann consortium came apart and did not provide a final bid for RJR. In November 1988, RJR set guidelines for a final bid submission at the end of the month. The management and Shearson group submitted a final bid of $112, a figure they felt certain would enable them to outflank any response by Kravis and KKR. KKR's final bid of $109, while a lower dollar figure, was ultimately accepted by the board of directors of RJR Nabisco. KKR's offer was guaranteed, whereas the management offer lacked a "reset", meaning that the final share price might have been lower than their stated $112 per share. Additionally, many in RJR's board of directors had grown concerned at recent disclosures of Ross Johnson's unprecedented golden parachute deal. Time Magazine featured Johnson on the cover of their December 1988 issue along with the headline, "A Game of Greed: This man could pocket $100 million from the largest corporate takeover in history. Has the buyout craze gone too far?". KKR's offer was welcomed by the board, and, to some observers, it appeared that their elevation of the reset issue as a deal-breaker in KKR's favor was little more than an excuse to reject Johnson's higher bid of $112 per share. Johnson received $53 million from the buyout. KKR collected a $75 million fee in the RJR takeover. At $31.1 billion of transaction value (including assumed debt), RJR Nabisco was, at the time, by far the largest leveraged buyout in history. In 2006 and 2007, a number of leveraged buyout transactions were completed which surpassed the RJR Nabisco leveraged buyout in terms of nominal purchase price. The deal was first surpassed in July 2006 by the $33 billion buyout of U.S. hospital operator Hospital Corporation of America, in which KKR participated. However, adjusted for inflation, none of the leveraged buyouts of the 2006–07 period would surpass RJR Nabisco. The buyout of RJR Nabisco was completed in April 1989 and KKR would spend the early 1990s repaying the RJR's enormous debt load through a series of asset sales and restructuring transactions. KKR did not complete a single investment in 1990, the first such year since 1982. KKR began to focus primarily on its existing portfolio companies acquired during the buyout boom of the late 1980s. Six of KKR's portfolio companies completed IPOs in 1991, including RJR Nabisco and Duracell. As the new decade began, KKR began restructuring RJR. In January 1990, it completed the sale of RJR's Del Monte Foods to a group led by Merrill Lynch. KKR had originally identified a group of divisions that it could sell to reduce debt. Over the coming years, RJR would pursue a number of additional restructurings, equity injections and public offerings of stock to provide the company with added financial flexibility. KKR contributed $1.7 billion of new equity into RJR in July 1990 to complete a restructuring of the company's balance sheet. KKR's equity contribution as part of the original leveraged buyout of RJR had been only $1.5 billion. In mid-December 1990, RJR announced an exchange offer that would swap debt in RJR for a new public stock in the company, effectively an unusual means of taking RJR public again and simultaneously reducing debt on the company. RJR issued additional stock to the public in March 1991 to further reduce debt, resulting in an upgrade of the credit rating of RJR's debt from junk to investment grade. KKR began to reduce its ownership in RJR in 1994, when its stock in RJR was used as part of the consideration for its leveraged buyout of Borden, Inc., a producer of food and beverage products, consumer products, and industrial products. The following year, in 1995, KKR would divest itself of its final stake in RJR Nabisco when Borden sold a $638 million block of stock. While KKR no longer had any ownership of RJR Nabisco by 1995, its original investment would not be fully realized until KKR exited its last investment in 2004. After sixteen years of efforts, including contributing new equity, taking RJR public, asset sales and exchanging shares of RJR for the ownership of Borden, Inc., KKR finally sold the last remnants of its 1989 investment. In July 2004, KKR agreed to sell its stock in Borden Chemical to Apollo Management for $1.2 billion. In the early 1990s, the absence of an active high yield market prompted KKR to change its tactics, avoiding large leveraged buyouts in favor of industry consolidations through what were described as leveraged buildups or rollups. One of KKR's largest investments in the 1990s was the leveraged buildup of Primedia in partnership with former executives of Macmillan Publishing, which KKR had failed to acquire in 1988. KKR created Primedia's predecessor, K-III Communications, a platform to buy media properties, initially completing the $310 million divisional buyout of the book club division of Macmillan along with the assets of Intertec Publishing Corporation in May 1989. During the early 1990s, K-III continued acquiring publishing assets, including a $650 million acquisition from News Corporation in 1991. K-III went public, however instead of cashing out, KKR continued to make new investments in the company in 1998, 2000 and 2001 to support acquisition activity. In 2005, Primedia redeemed KKR's preferred stock in the company but KKR was estimated to have lost hundreds of millions of dollars on its common stock holdings as the price of the company's stock collapsed. In 1991, KKR partnered with Fleet/Norstar Financial Group in the 1991 acquisition of the Bank of New England, from the US Federal Deposit Insurance Corporation. In January 1996, KKR would exchange its investment for a 7.5% interest in Fleet Bank. KKR completed the 1992 buyout of American Re Corporation from Aetna as well as a 47% interest in TW Corporation, later known as The Flagstar Companies and owner of Denny's in 1992. Among the other notable investments KKR completed in the early 1990s included World Color Press (1993–95), RELTEC Corporation (1995) and Bruno's (1995). By the mid-1990s, the debt markets were improving and KKR had moved on from the RJR Nabisco buyout. In 1996, KKR was able to complete the bulk of fundraising for what was then a record $6 billion private equity fund, the KKR 1996 Fund. However, KKR was still burdened by the performance of the RJR investment and repeated obituaries in the media. KKR was required by its investors to reduce the fees it charged and to calculate its carried interest based on the total profit of the fund (i.e., offsetting losses from failed deals against the profits from successful deals). KKR's activity level would accelerate over the second half of the 1990s making a series of notable investments including Spalding Holdings Corporation and Evenflo (1996), Newsquest (1996), KinderCare Learning Centers (1997), Amphenol Corporation (1997), Randalls Food Markets (1997), The Boyds Collection (1998), MedCath Corporation (1998), Willis Group Holdings (1998), Smiths Group (1999), and Wincor Nixdorf (1999). KKR's largest investment of the 1990s would be one of its least successful. In January 1998, KKR and Hicks, Muse, Tate & Furst agreed to the $1.5 billion buyout of Regal Entertainment Group. KKR and Hicks Muse had initially intended to combine Regal with Act III Cinemas, which KKR had acquired in 1997 for $706 million and United Artists Theaters, which Hicks Muse had agreed to acquire for $840 million in November 1997. Shortly after agreeing to the Regal takeover, the deal with United Artists fell apart, destroying the strategy to eliminate costs by building a larger combined company. Two years later, in 2000, Regal encountered significant financial issues and was forced to file for bankruptcy protection; the company passed to billionaire investor Philip Anschutz. At the start of the 21st century, the landscape of large leveraged buyout firms was changing. Several large and storied firms, including Hicks Muse Tate & Furst and Forstmann Little & Company were dragged down by heavy losses in the bursting of the telecom bubble. Although, KKR's track record since RJR Nabisco was mixed, losses on such investments as Regal Entertainment Group, Spalding, Flagstar and Primedia (previously K-III Communications) were offset by successes in Willis Group, Wise Foods, Inc., Wincor Nixdorf and MTU Aero Engines, among others. Additionally, KKR was one of the few firms that was able to complete large leveraged buyout transactions in the years immediately following the collapse of the Internet bubble, including Shoppers Drug Mart and Bell Canada Yellow Pages. KKR was able to realize its investment in Shoppers Drug Mart through a 2002 IPO and subsequent public stock offerings. The directories business would be taken public in 2004 as Yellow Pages Income Fund, a Canadian income trust. In 2004 a consortium comprising KKR, Bain Capital and real estate development company Vornado Realty Trust announced the $6.6 billion acquisition of Toys "R" Us, the toy retailer. A month earlier, Cerberus Capital Management, made a $5.5 billion offer for both the toy and baby supplies businesses. The Toys 'R' Us buyout was one of the largest in several years. Following this transaction, by the end of 2004 and in 2005, major buyouts were once again becoming common and market observers were stunned by the leverage levels and financing terms obtained by financial sponsors in their buyouts. In 2005, KKR was one of seven private equity firms involved in the buyout of SunGard in a transaction valued at $11.3 billion. KKR's partners in the acquisition were Silver Lake Partners, Bain Capital, Goldman Sachs Capital Partners, Blackstone Group, Providence Equity Partners, and TPG Capital. This represented the largest leveraged buyout completed since the takeover of RJR Nabisco in 1988. SunGard was the largest buyout of a technology company until the Blackstone-led buyout of Freescale Semiconductor. The SunGard transaction was notable given the number of firms involved in the transaction, the largest club deal completed to that point. The involvement of seven firms in the consortium was criticized by investors in private equity who considered cross-holdings among firms to be generally unattractive. Other non-buyout investments completed by KKR during this period included Legg Mason, Sun Microsystems, Tarkett, Longview Power Plant, and Seven Network. In October 2006, KKR acquired a 50% stake in Tarkett, a France-based distributor of flooring products, in a deal valued at about €1.4 billion ($1.8 billion). On November 20, 2006, KKR announced it would form a A$4 billion partnership with the Seven Network of Australia. On January 23, 2007, KKR announced it would invest $700 million through a PIPE investment in Sun Microsystems. In January 2008, KKR announced it had made a $1.25 billion PIPE investment in Legg Mason through a convertible preferred stock offering. In addition to its successful buyout transactions, KKR was involved in the failed buyout of Harman International Industries (NYSE: HAR), an upscale audio equipment maker. On April 26, 2007, Harman announced it had entered an agreement to be acquired by KKR and Goldman Sachs. As the financing markets became more adverse[clarification needed] in the summer of 2007, the buyout was on tenuous ground. In September 2007, KKR and Goldman backed out of the $8 billion buyout of Harman. By the end of the day, Harman's shares had plummeted by more than 24% upon the news. In 2007, KKR filed with the Securities and Exchange Commission to raise $1.25 billion by selling an ownership interest in its management company. The filing came less than two weeks after the initial public offering of rival private equity firm Blackstone Group. KKR had previously listed its KPE vehicle in 2006, but for the first time, KKR would offer investors an ownership interest in the management company itself. The onset of the credit crunch and the shutdown of the IPO market dampened the prospects of obtaining a valuation attractive to KKR. The flotation was repeatedly postponed, and called off by the end of August. The following year, in July 2008, KKR announced a new plan to list its shares. The plan called for KKR to complete a reverse takeover of its listed affiliate KKR Private Equity Investors in exchange for a 21% interest in the firm. In November 2008, KKR announced a delay of this transaction until 2009. Shares of KPE had declined significantly in the second half of 2008 with the onset of the credit crunch. KKR has announced that it expects to close the transaction in 2009. In October 2009, KKR listed shares in KKR & Co. on the Euronext exchange, replacing KPE and anticipates a listing on the New York Stock Exchange in 2010. The public entity represents a 30% interest in Kohlberg Kravis Roberts. In October 2010, KKR acquired about nine members of Goldman Sachs Group proprietary trading team after entertaining offers from investment firms such as Perella Weinberg and Blackrock. With Goldman shutting down its proprietary trading operations, its executives, led by Bob Howard, will help KKR expand beyond leveraged buyouts into areas such as hedge funds. In December 2011, Samson Investment Company was acquired by a group of private equity investors led by KKR for approximately $7.2 billion and Samson Resources Corporation was formed. With the severe downturn in oil and natural gas prices, in September 2015, the Company went into Chapter 11 bankruptcy and during its bankruptcy process, sold several large assets. In January 2014, KKR acquired Sedgwick Claims Management Services Inc for $2.4 billion from two private equity companies - Stone Point, and Hellman & Friedman. In June 2014, KKR announced it was taking a one-third stake in a Spanish energy business of Acciona Energy, at a cost of €417 million ($567 million). The international renewable energy generation business operates renewable assets, largely wind farms, across 14 countries including the United States, Italy and South Africa. In August 2014, KKR announced it was investing $400 million to acquire Fujian Sunner Development, China's largest chicken farmer, which breeds, processes and supplies frozen and fresh chickens to consumers and corporate clients, such as KFC and McDonald's, across China. In September 2014, the firm invested $90 million in a lighting and electrics firm Savant Systems. In January 2015, KKR confirmed its purchase of British rail ticket website thetrainline.com, previously owned by Exponent. The purchase sum is unknown. On October 12, 2015, KKR announced that it has entered into definitive agreement with Allianz Capital Partners to acquire their majority stake in Selecta Group, a European vending services operator. In 2016, Kohlberg Kravis Roberts purchased 2 Hispanic Chains: Northern California Mi Pueblo along with Ontario, California–based Cardenas. In February 2016, KKR invested $75 million in commercial real estate lender A10 Capital. On September 1, 2016, KKR announced that it had acquired Epicor Software Corporation, an American software company. In October 2016, it was reported that KKR invested $250 million in OVH to be used for further international expansion. This funding round valued OVH at over $1 billion, making it a unicorn. In December 2016, the Lonza Group announced it would acquire Capsugel for $5.5 billion from Kohlberg Kravis Roberts. In February 2017 KKR were reported to be trying to take over the international market research company ARI GfK SE. In July of the same year KKR acquired WebMD Health Corp for $2.8 billion and in August acquired PharMerica for $1.4 billion including debt,Pepper Group for $518 million, Covenant Surgical Partners, and Envision Healthcare Corporations ambulance business for $2.4 billion. On September 18, 2017, Toys "R" Us, Inc. filed for Chapter 11 bankruptcy, stating the move would give it flexibility to deal with $5 billion in long-term debt, borrow $2 billion so it can pay suppliers for the upcoming holiday season and invest in improving current operations. In July 2018, it was announced that KKR sold Gallagher Shopping Park, West Midlands in the UK to South Korean investors, Hana for £175 million. In February 2019, KKR acquired the German media company Tele München Gruppe. Later that month, KKR acquired German film stidio Universum Film. Over the years, KKR has seen the departure of many of its original partners, the most notable being original co-founder Jerome Kohlberg. After a leave of absence due to an illness in 1985, Kohlberg returned to find increasing differences in strategy with his partners Kravis and Roberts. In 1987, Kohlberg left KKR to found a new private equity firm Kohlberg & Company. Kohlberg & Company returned to the investment style that Kohlberg had originally practiced at Bear Stearns and in KKR's earlier years, acquiring smaller, middle-market companies. Since 1996, general partners of KKR have included Henry Kravis, George R. Roberts, Paul Raether, Robert MacDonnell, Jose Gandarillas, Michael Michelson, Saul Fox, James Greene, Michael Tokarz, Clifton Robbins, Scott Stuart, Perry Golkin and Edward Gilhuly. Among those who left were Saul Fox, Ted Ammon, Ned Gilhuly, Mike Tokarz and Scott Stuart who had been instrumental in establishing KKR's reputation and track record in the 1980s. KKR remains tightly controlled by Kravis and Roberts. The issue of succession has remained an important consideration for KKR's future as an ongoing institutionalized firm. Scott C. Nuttall (born 1972), heads KKR's fastest-growing department, the Global Capital and Asset Management Group, which includes Asset Management, Capital Markets and Client and Partner Group. He joined KKR in November 1996 after leaving the Blackstone Group. His group, the firm's fastest-growing division, has $25 billion under management. With the support of co-founder George Roberts, Nuttall has largely spearheaded the campaign to expand KKR beyond its institutional investors (legacy and otherwise) into credit investment, and alternative investments, pointing out that there are billions "in revenues up for grabs". He has been named co-presidents and co-chief operating officers with Joseph Bae on July 17, 2017, to be responsible for the day-to-day operations of the firm. He will concentrate on KKR's corporate and real estate credit, capital markets, hedge fund and capital raising businesses together with the firm's corporate development, balance sheet and strategic growth initiatives. New York Times called him and Joseph Bae as potential successors. He graduated from University of Pennsylvania with a Bachelor of Science degree. Joseph Bae (born circa 1972) joined KKR from Goldman Sachs in 1996. Most recently, he was the managing partner of KKR Asia and the global head of KKR's Infrastructure and Energy Real Asset businesses. Mr. Bae has been the architect of KKR's Asian expansion since 2005. He has been named co-presidents and co-chief operating officers with Scott Nuttall on July 17, 2017, to be responsible for the day-to-day operations of the firm. Mr. Bae will focus on KKR's global private equity businesses as well as the Firm's real asset platforms across energy, infrastructure and real estate private equity. He graduated with a Bachelor of Arts degree from Harvard College. Alexander Navab joined KKR from Goldman Sachs in 1993 and was the former head of Americas Private Equity. After spending 24 years at the firm, he stepped down as part of the Nuttall-Bae transition and would retire. In September 2017, he was elected to Columbia University's board of trustees. He was born in Isfahan, Iran, but followed his family and became a refugee in Greece following the Iranian Revolution. They immigrated to the United States two years later. He received a bachelor of arts degree from Columbia College, Columbia University, and an MBA degree from Harvard Business School. In 2016, he was honored with Ellis Island Medal of Honor. Clifton S. Robbins left KKR to join competitor General Atlantic Partners in 2000 and later founded Blue Harbour Group, a private investment firm based in Greenwich, Connecticut. Edward A. Gilhuly and Scott Stuart left KKR in 2004 to launch Sageview Capital. Prior to this, Gilhuly was the managing partner of KKR's European operations, based in London; Stuart managed KKR's energy and consumer products industry groups. Ted Ammon, started several new ventures including Big Flower Press, which printed newspaper circulars, and Chancery Lane Capital, a boutique private equity firm, before being murdered in his Long Island home October 2001. The lover of his estranged, now deceased wife, Generosa, was later convicted. Paul Hazen, served as chairman and CEO of Wells Fargo (1995–2001). Hazen later returned to KKR to serve as chairman of Accel-KKR, a joint venture with Accel Partners and later as chairman of KKR's publicly listed affiliate, KFN. Ken Mehlman joined KKR in 2008 as global head of public affairs. Baker, George; Smith, George (1998). The New Financial Capitalists: KKR and the Creation of Corporate Value. New York: Cambridge University Press. ISBN 978-0-521-64260-6. Anders, George (1992). Merchants of Debt: KKR and the Mortgaging of American Business. New York: BasicBooks. ISBN 978-0-465-04522-8. Bartlett, Sarah (1991). The Money Machine: How KKR Manufactured Power & Profits. New York: Warner Books. ISBN 978-0-446-51608-2. Burrough, Bryan (1990). Barbarians at the Gate. New York: Harper & Row. ISBN 0-06-016172-8. ^ "BRIEF-KKR & co LP reports second quarter 2017 results". Reuters. July 27, 2017. ^ "KKR". Fortune. Retrieved 2018-12-31. ^ "KKR Private Equity". kkr.com. ^ "KKR & Co. L.P. - Current Report". ir.kkr.com. Archived from the original on 2017-11-07. Retrieved 2017-11-03. ^ "What's An Aging 'Barbarian' To Do?" The New York Times, August 26, 2001. ^ "KKR to Relocate Corporate Headquarters to Manhattan's Transformative New Neighborhood on the West Side | Business Wire". www.businesswire.com. Retrieved 2015-12-31. ^ "KKR Files for NYSE Listing", March 17, 2010. ^ "KKR Appoints Joe Bae and Scott Nuttall as Co-Presidents and Co-Chief Operating Officers". media.kkr.com. Archived from the original on 2017-08-07. Retrieved 2017-07-17. ^ Kelly, Jason (June 13, 2016). "Henry Kravis Q&A: 'Worry About What You Might Lose on the Downside'". Bloomberg Markets. ^ a b "KKR & Co. L.P. 2017 Form 10-K". United States Securities and Exchange Commission. ^ Franklin, Joshua (December 11, 2017). "FS Investments moves lending platform from Blackstone to KKR". Reuters. ^ Tan, Gillian (July 27, 2017). "KKR: Either a Borrower or Lender Be". Bloomberg. ^ Scigliuzzo, Davide (October 21, 2016). "KKR reaps reward from going it alone". Reuters. ^ "KKR Real Estate: The first six years". PERE. September 8, 2017. ^ a b c d e f g h Kohlberg Kravis Roberts & Co. Company History. Funding Universe; retrieved February 16, 2009. ^ Burrough, Bryan. Barbarians at the Gate. New York: Harper & Row, 1990; pp. 133-136. ^ Nkambule, Sicelo (May 20, 2014). A Pursuit of Wealth. Nathan Eli. ISBN 9781312206557. ^ Burrough, Bryan. Barbarians at the Gate (New York: Harper & Row, 1990), pp. 136-140. ^ Holland, Max (1989), When the Machine Stopped: A Cautionary Tale from Industrial America, Boston: Harvard Business School Press, ISBN 978-0-87584-208-0, OCLC 246343673. , pp. 149–169. ^ Malone & Hyde Accepts Bid The New York Times, June 12, 1984. ^ Wayne, Leslie. "Wometco Agrees To Buyout", The New York Times. September 22, 1983. ^ Dodson, Steve. "Beatrice Deal Is Biggest Buyout Yet". The New York Times, November 17, 1985. ^ Sterngold, James. "Drexel's Role in Beatrice Deal Examined". The New York Times, April 28, 1988. ^ Fisher, Lawrence M. Safeway Buyout: A Success Story. The New York Times, October 21, 1988. ^ Feder, Barnaby. "Asbestos: The Saga Drags On". The New York Times, April 2, 1989. ^ "Chapter 11 For Kohlberg, Kravis Unit". The New York Times, December 28, 1989. ^ "The Granddaddy Of All Takeovers", The New York Times Book Review, January 21, 1990. ^ "Nabisco Executives Offer $17 Billion for Company". The New York Times, October 21, 1988. ^ "Shearson Risks, Rewards on RJR Nabisco". The New York Times, October 22, 1988. ^ "Nabisco Bid Seen by Kohlberg". The New York Times, October 24, 1988. ^ "Buyout Specialist Bids $20.3 Billion For RJR Nabisco". The New York Times, October 25, 1988. ^ "RJR Nabisco Bid Gives New Respectability To Giant Deals Financed With Huge Debt". The New York Times, October 26, 1988. ^ "Several Giant Pension Funds Investing in Offer for Nabisco". The New York Times, October 31, 1988. ^ "Concern Over Kohlberg, Kravis Strategy". The New York Times, November 2, 1988. ^ "RJR Nabisco Bidders Said to Talk". The New York Times, October 26, 1988. ^ "The Nabisco Battle's Key Moment". The New York Times, December 2, 1988. ^ Joint Deal For Nabisco Is Rejected. The New York Times, October 27, 1988. ^ Forstmann Declines to Bid on RJR Nabisco. The New York Times, November 17, 1988. ^ "Suitors Quarrel Over RJR Nabisco". The New York Times, November 8, 1988. ^ RJR Nabisco Discloses Guidelines for Its Buyout. The New York Times, November 9, 1988. ^ "RJR Nabisco Suitor Claims $24.88 Billion Victory". The New York Times, December 1, 1988. ^ "Nabisco Executives to Take Huge Gains in Their Buyout". The New York Times, November 5, 1988. ^ "Kohlberg, Kravis to Collect $75 Million RJR Nabisco Fee". The New York Times, February 1, 1989. ^ "RJR Nabisco, An Epilogue". The New York Times, March 12, 1999. ^ "Kohlberg, Kravis Now RJR's Owner". Associated Press, April 29, 1989. ^ "History Of The RJR Nabisco Takeover". The New York Times, December 2, 1988. ^ "Is RJR Worth $25 Billion?" The New York Times, December 2, 1988. ^ "RJR Completes Sale of Del Monte". The New York Times, January 11, 1990. ^ "Kohlberg, Kravis, Roberts Loan to RJR Renegotiated". The New York Times, June 27, 1990. ^ "RJR Move Helps Lift 'Junk Bonds'". The New York Times, July 17, 1990. ^ "RJR Offers Cash and Stock for 'Junk Bonds'". The New York Times, December 18, 1990. ^ Agrees to a Takeover. The New York Times, September 13, 1994. ^ "Kohlberg's Impetus in Borden Deal". The New York Times, September 14, 1994. ^ "Borden Signs Agreement for Sale to Kohlberg". The New York Times, September 24, 1994. ^ "Kohlberg, Kravis Says It Has Control of Borden". The New York Times, December 22, 1994. ^ "Kohlberg, Kravis Plans to Divest Remaining Stake in RJR Nabisco". The New York Times, March 16, 1995. ^ "Apollo Buys Borden Chemical for $649 million". The New York Times, July 7, 2004. ^ "Kohlberg Ends Bid for Macmillan". The New York Times, November 4, 1988. ^ K-III's New Name To Be 'Primedia'. The New York Times, November 1, 1997. ^ "Macmillan Book Club Unit And a Publisher Being Sold". The New York Times, May 23, 1989. ^ a b "As Primedia Falls, Preferred Stock Lives Up to Its Name". The New York Times, October 26, 2005. ^ "K-III Communications Files Plan For an Initial Offering of Stock". The New York Times, September 6, 1995. ^ Regulators Pick Buyer To Operate New England Bank. The New York Times, April 23, 1991. ^ "Kohlberg Kravis in Swap for 7.5% of Fleet". The New York Times, January 3, 1996. ^ "Kohlberg, Kravis in Aetna Reinsurance Deal". The New York Times, June 9, 1992. ^ "Kohlberg, Kravis Plans Stake in TW". The New York Times, June 26, 1992. ^ "Kohlberg Unit to Buy Alden Press". The New York Times, January 19, 1993. ^ "Kohlberg, Kravis to Acquire Bruno's Supermarket Chain". The New York Times, April 21, 1995. ^ "$5 Billion Fund By Kohlberg Seen". The New York Times, September 13, 1996. ^ "At K.K.R., the Glory Days Are Past". The New York Times, August 10, 1995. ^ "Kohlberg Plans Stake In Spalding And Evenflo". The New York Times, August 16, 1996. ^ "Newsquest Company History". FundingUniverse.com; retrieved February 16, 2009. ^ "Kohlberg Kravis Will Buy Kindercare for $467 Million". The New York Times, October 4, 1996. ^ "Kohlberg Kravis Set to Offer $1.2 Billion for Cable Maker". The New York Times, January 24, 1997. ^ Roundup, An Interactive Edition News (1997-06-28). "KKR Completes Purchase Of Randalls for $225 Million". Wall Street Journal. ISSN 0099-9660. Retrieved 2016-12-19. ^ "Supermarkets Get a Brand New Bag". The New York Times, August 31, 1997. ^ "The Boyds Collection, Ltd. Company History". FundingUniverse.com; retrieved February 16, 2009. ^ "Kohlberg Kravis And Welsh Carson Acquiring Medcath". The New York Times, March 14, 1998. ^ "Kohlberg Kravis-Led Group To Buy Big Insurance Broker". The New York Times, July 23, 1998. ^ "Wincor Nixdorf Holding Company History". FundingUniverse.com; retrieved February 16, 2009. ^ Kohlberg Kravis In $660 Million Deal For Act III Cinemas. The New York Times, October 21, 1997. ^ "Amid Blame, United Artists Sale Collapses". The New York Times, February 23, 1998. 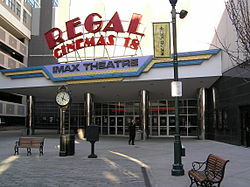 ^ "Regal Cinemas Considers Filing For Bankruptcy". The New York Times, November 16, 2000. ^ "BCE Sells Directory Unit". The New York Times, November 30, 2002. ^ "Yellow Pages Income Fund Announces, 43 Million Offering". Yellow Pages Group press release, May 26, 2004; retrieved February 16, 2009. ^ Sorkin, Andrew Ross and Rozhon, Tracie. "Three Firms Are Said to Buy Toys 'R' Us for $6 Billion". New York Times, March 17, 2005. 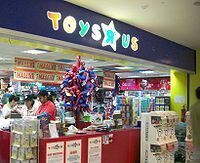 ^ What's Next for Toys 'R' Us?. The Wall Street Journal, March 18, 2005. ^ "Deal Mania: Shades of the '80s: The leveraged buyout is back in vogue" Archived 2008-11-01 at the Wayback Machine. US News & World Report, April 10, 2005. ^ "Capital Firms Agree to Buy SunGard Data in Cash Deal". The New York Times, March 29, 2005. ^ "Do Too Many Cooks Spoil the Takeover Deal?" The New York Times, April 3, 2005. ^ K.K.R., Texas Pacific Plan Record Buyout of TXU. The New York Times, February 23, 2007. ^ Sorkin, Andrew Ross. "HCA Buyout Highlights Era of Going Private". The New York Times, July 25, 2006. ^ Bloomberg News (August 4, 2006). "Technology; Royal Philips Sells Unit for $4.4 Billion". The New York Times. Retrieved April 27, 2008. ^ "TDC-One year on Archived 2015-05-01 at the Wayback Machine." Dow Jones Private Equity News, January 22, 2007; retrieved February 16, 2009. ^ Peters, Jeremy W. (March 13, 2007). "Buyout Firm Is Acquiring Dollar General Retail Chain". The New York Times. Retrieved January 4, 2009. ^ Werdigier, Julia. "Equity Firm Wins Bidding for a Retailer, Alliance Boots". The New York Times, April 25, 2007. ^ "Terra Firma drops Boots bid plan". BBC. April 24, 2007. ^ "Kohlberg Kravis to Buy First Data for $29 Billion". The New York Times, April 3, 2007. ^ Lonkevich, Dan and Klump, Edward. KKR, Texas Pacific Will Acquire TXU for $45 Billion Bloomberg.com, February 26, 2007. ^ Skariachan, Dhanya (February 26, 2007). "KKR, Texas Pacific-led group to buy TXU Corp". Reuters. ^ "Wary Buyers May Scuttle Two Deals". The New York Times, September 22, 2007. ^ Jenny Anderson and Michael J. de la Merced. "Kohlberg Kravis Plans to Go Public", The New York Times, July 4, 2007. ^ "KKR postpones $1.25 bn float as credit chaos deters buyers". The Times (UK), August 23, 2007. ^ After Delay, KKR Finds a Way to Go Public. The New York Times, July 28, 2008. ^ K.K.R. Calls Listing Delay ‘Process Related’. The New York Times, November 3, 2008. ^ Neha Dimri; Aman Shah (28 January 2014). "KKR to take control of Sedgwick Claims Management in $2.4 billion deal". Reuters. ^ "KKR to acquire China chicken developer for $400 mn". Business Sun. 26 August 2014. Retrieved 27 August 2014. ^ "Deals of the day - Mergers and acquisitions". Reuters. Retrieved 2015-01-22. ^ "KKR | KKR agrees to acquire majority stake in Selecta from ACP". media.kkr.com. Archived from the original on 2015-10-19. Retrieved 2015-10-12. ^ "KKR invests $75 mln in A10 Capital - PE Hub". PE Hub. 2016-02-10. Retrieved 2017-10-16. ^ "Epicor Announces Close of KKR Acquisition and Executive Leadership Appointments to Accelerate Growth Strategy". media.kkr.com. Archived from the original on 2016-09-06. Retrieved 2016-09-01. ^ "Klaba Family OVH, Europe No. 1 Web Host, Raises €250M from $KKR, TowerBrook". exithub. Retrieved 14 January 2017. ^ "Lonza Buys Capsugel for $5.5B Cash - GEN Genetic Engineering & Biotechnology News - Biotech from Bench to Business - GEN". GEN. Retrieved 5 June 2017. ^ Banerjee, Ankur. "KKR has eye on health with WebMD, Nature's Bounty deals". ^ Editorial, Reuters. "KKR to take PharMerica private in $1.4 billion deal". ^ Editorial, Reuters. "Australia's Pepper Group accepts $518 million KKR takeover offer". ^ Editorial, Reuters. "BRIEF-KKR to acquire Covenant Surgical Partners". ^ Editorial, Reuters. "Envision to sell ambulance business to KKR in $2.4 billion deal". ^ Hals, Tom; Rucinski, Tracy. "Toys 'R' Us seeks bankruptcy to survive retail upheaval". Reuters.com. Reuters. Retrieved September 19, 2017. ^ "KKR Sells West Midlands Retail Park for £175m to Korean Investors". commercialpeople.com. 30 July 2018. ^ "Buyout Pioneer Quitting Fray". The New York Times, June 19, 1987. ^ Kohlberg In Dispute Over Firm. The New York Times, August 30, 1989. ^ "Kohlberg Suit Settlement". The New York Times, February 23, 1990. ^ Duracell International Inc. SEC Form SC 13G/A ("Statement of acquisition of beneficial ownership"); filed February 6, 1996. ^ Baker, George; Smith, George (1998). The New Financial Capitalists: KKR and the Creation of Corporate Value. New York: Cambridge University Press. ISBN 978-0-521-64260-6. ^ "A kinder, gentler KKR wants a piece of your 401K", Forbes, January 23, 2013. ^ Profile of Scott Nuttall at investing.businessweek.com, Businessweek.com, January 23, 2013. ^ a b c "KKR Appoints Joe Bae and Scott Nuttall as Co-Presidents and Co-Chief Operating Officers". KKR Press Release. Archived from the original on 2017-08-07. Retrieved 17 July 2017. ^ de la Merced, Michael J. "Next Generation at K.K.R. Set as It Names Two Co-Presidents". New York Times. Retrieved 17 July 2017. ^ "Alex Navab". KKR. Retrieved 17 September 2017. ^ Bollinger, Lee C. "Alexander Navab and Li Lu Elected to Columbia University Board of Trustees". Columbia University. Retrieved 17 September 2017. ^ "Medalists Database". The National Ethnic Coalition of Organization. Retrieved 17 September 2017. ^ ""For Saul Fox, Bigger Isn’t Always Better in the World of Buyouts". foxpaine.com, May 15, 2000. Retrieved February 16, 2009. ^ Anders, George. "Bitter End of a Partnership", Wall Street Journal, September 15, 2007. ^ Blue Harbour Group> About Blue Harbour Archived 2008-03-13 at the Wayback Machine (company website); retrieved February 16, 2009. ^ a b c Barbarians at the Gate: Contrasting fortunes for those closest to the deal. eFinancial News, November 3, 2008; retrieved February 16, 2009. ^ "Pelosi Found Guilty of Murder". CBS News. December 13, 2004. Retrieved May 17, 2007. ^ "Murder in East Hampton", Vanity Fair, January 2002. ^ "Mystery of the Murdered Millionaire". Dateline NBC; retrieved February 16, 2009. ^ Paul M. Hazen profile as Wells Fargo & Co. Chairman and CEO Archived 2005-09-14 at the Wayback Machine; retrieved February 16, 2009. ^ "KKR names former CIA head Petraeus as chairman of new institute". 30 May 2013. Retrieved 5 June 2017 – via Reuters. FT.com / Industries / Basic industries – "KKR set to buy Masonite for C$3.1bn"
Gross, Daniel & David Sterling. "Has Henry Kravis gone soft?". Slate, August 5, 2007; retrieved August 7, 2007. "The barbarians at the gate have been losing their Midas touch". timesonline.co.uk, August 6, 2005; retrieved February 16, 2009.